Internal margins control the amount of blank space between the perimeter (edge) and the actual text within all three types of text containers - text boxes, text placeholders and shapes. Although these margins are similar to the margins of pages in a word-processing document like Microsoft Word, there is a significant difference. Each text container has its own individual margins set, and you can have entirely different margins for one or more text containers, even if they reside on the same slide. 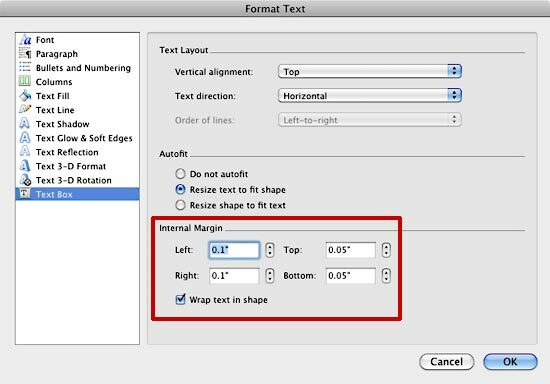 In this tutorial, we will explore how to set and change these internal margins for text within a text container in PowerPoint 2011. It's always recommended that the margin settings should be done on the slide itself only for text boxes (and shapes) rather than individual text placeholders. You can set margins for text placeholders too, but best practices dictate that you make these changes for text placeholders within the Slide Master - thus providing a consistent look to successive slides in your presentation. Tip: Don't know the difference between a text box and a text placeholder? Look at our Text Boxes vs. Text Placeholders tutorial. Open any slide which has a text container -- click on the edge of the text container so that it shows a solid line with selection handles on its perimeter, which indicates that it has been selected. In Figure 1, you can see a text box selected. Right-click to access the contextual menu you see in Figure 2 -- select the Format Text option (refer to Figure 2 again). 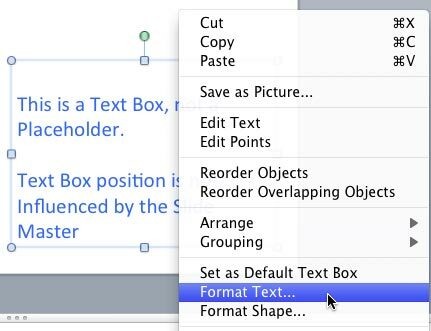 This will open the Format Text dialog box (see Figure 3). Make sure you choose Text Box option within the sidebar of this dialog box (refer to Figure 3 again). Within the Format Text dialog box, locate the Internal Margin section (highlighted in red within Figure 3). This section provides options to tweak the space around the text within the text container. You'll find four separate boxes to enter values for the internal margins -- these are Left, Top, Right, and Bottom. Enter the values or use the up and down arrows to change the margin value in each of these four boxes. Figure 4 shows the difference between the text box with default internal margins and the same text box with changed internal margins -- you can see the original text box on the left, and the text box on the right has larger margins. Right below the Internal Margin setting boxes, you'll find the Wrap text in shape check-box -- when selected, this causes text to flow within the shape. In Figure 5, the shape shown towards left contains the text that is not wrapped, and the same shape shown towards right contains the wrapped text.